Has anyone else been experiencing really, really slow wireless internet speeds? I thought it may have been a virus (on my Mac???) until I plugged in an ethernet cable and all was fine. It seriously takes about 3 minutes to load the Drew homepage and get to webmail. And on busy nights, I won't even be able to access the internet. We pay a $150 technology fee - does that include this? I figure they should include some free coffee while we wait for the pages to load for that cost. Anyone else with a similar or different experience? Edit: I lived in the building last year, and it was never as bad as it is now. Last edited by Jordan M. Maslin : 09-03-2011 at 11:49 PM. Probably over time, people become more and more accustomed to using wireless networks, so usage of the wireless network here becomes more commonplace over using the wired network and it becomes congested. Over time if people realize that the wired network runs stupid fast we might see more people switch over to it and the speeds should reach an equilibrium. We are aware of it, but we can't just flick a switch and fix it. It seems to be that as more and more people have more and more wireless devices (smartphones, tablets, video games, etc. ), the network is becoming more congested and it's harder for the wireless to work. Also, anything that runs at 2.4 GHz (Wiimotes; Bluetooth headsets, printers, speakers; microwave ovens; cordless phones; etc.) add interference that the access points and computers have to continually adjust for which affects performance. One thing that would almost certainly help is if people turned off their own access points. That just causes even more interference and messes with everyone. We can't legally disable them, but we can ask you nicely to stop using them. We bought some new wireless testing equipment and will be using that to see if we can optimize the signal quality, but in a dense setting like a residence hall we don't know what the limits are. And yes, use wired if you're in your room or near a jack. It will always be better. Thanks for the information, and I hope the new tests help to reveal potential improvements. 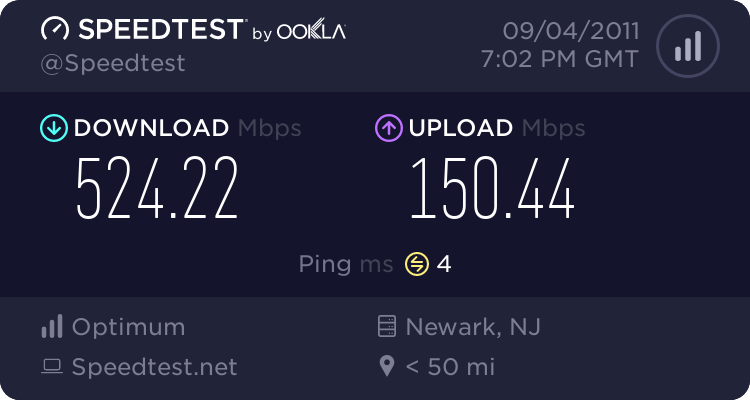 I've been using the wired network on one of my computers and it is phenomenal, but I only have one ethernet access port in my room. I do hope the speed remains close to what it is for a long time. It's the other computer I'm using simultaneously, the one I have to use the wireless for, that causes the hassle. Would I be able to use an ethernet splitter to get two signals from the jack? Last edited by Jordan M. Maslin : 09-04-2011 at 10:40 PM. I'd recommend getting a small ethernet switch - don't bother with a router. To maintain speed, you;d need to get one that's gigabit capable (usually marketed as 10/100/1000 Mb). You should be able to get a decent four or five port gigabit switch for under $30, and I think I've seen some on sale for under $20 lately. In terms of the wireless, it's going to be interesting. We actually have pretty sophisticated access points - one of the few brands that's any good at limiting interference and optimizing the signal. We made some configuration changes over the summer, and now we have to survey during peak usage times. We're going to focus on a couple of buildings in detail, get the best picture of what's going on that we can, and see if we can apply what we've learned to the other buildings.